Ever wondered what it’s like to spend time underwater using SCUBA equipment? Well, wonder no more as our PADI Discover Scuba Diving program offers you the chance to try Scuba Diving as a complete beginner. A PADI Discover Scuba Diving experience is a great way to find out what scuba diving is really like before you take a full PADI Scuba Certification Course. Minimum age is 10 years old (8 years for PADI Bubblemaker). A sense of fun & adventure. 2-3 hours of free time. In your Discover Scuba Diving Experience, your instructor will first do a briefing to explain the basic principles of scuba diving and give you an overview of the equipment and what it does. 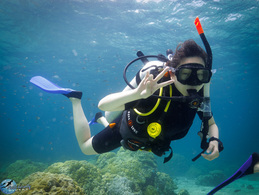 Your instructor will then take you to a shallow beach to help you learn basic scuba skills. Once comfortable, you will be taken on an underwater swim to a maximum depth of 12 metres to get you acquainted with the underwater environment. Our PADI instructors will guide you from start to finish through an experience that will definitely leave you wanting more. The whole experience usually takes 2-3 hours from start to finish. After PADI Discover Scuba Diving, you are not yet certified to go diving independently without an instructor present. However, the skills you learn during your PADI Discover Scuba Diving experience may be credited toward the full PADI Open Water Diver certification. The PADI Open Water Diver certification is your next step towards what could turn out to be a lifelong passion. Be warned...Diving is very addictive. We conduct the PADI Discover Scuba Diving in a shallow, sandy beach area with swimming pool like conditions that allows you to practice some basic skills, and become accustomed to being in the sea with diving equipment. We then take you to deeper water at the same site to explore the reef and enjoy the amazing underwater life that can be found around Perhentian. We use a variety of sites around the islands for the Discover Scuba Diving experience.